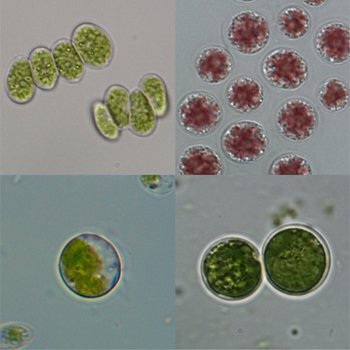 Image of protein-rich algae species. Top-left: Scenedesmus sp., top-right: Porphyridium sp., bottom-left: Monodus sp., bottom-right: Chlorococcum sp. Credit: Hidevaldo Machado and Yi-Xin Huo from Liao group. wo types of raw materials are currently used for biorefining and biofuel production: carbohydrates and lipids. Biofuels like ethanol are derived from carbohydrate raw materials such as sugars and lignocellulose, while biodiesels are derived from another raw material, lipid-rich vegetable oil. In a study published in the journal Nature Biotechnology, researchers at the UCLA Henry Samueli School of Engineering and Applied Science demonstrated for the first time the feasibility of using proteins—one of the most abundant biomolecules on earth—as a significant raw material for biorefining and biofuel production. In nutrient-rich conditions, proteins are the most abundant component in fast-growing microorganisms. The accumulation rate of proteins is faster than that of any other raw materials, including cellulose or lipids. In addition, protein does not have the recalcitrance problems of lignocellulose or the de-watering problem of algal lipids. Protein biomass can be much more easily digested to be used for microorganisms than cellulosic biomass, which is very difficult to break down. Further, cellulose and lipids don’t contribute to the process of photosynthesis. But proteins are the major component of fast-growing photosynthetic microorganisms. The challenge in protein-based biorefining, the researchers say, lies in the difficulties of effectively converting protein hydrolysates to fuels and chemicals. Liao’s team created an artificial metabolic system to dump reduced nitrogen out of cells and tricked the cells to degrade proteins without utilizing them for growth. 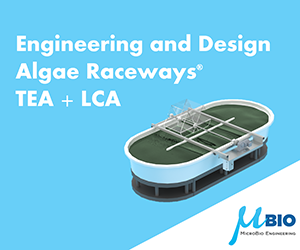 Proteins contain both ammonia and carbon; Liao’s team took away the ammonia and recycled it back for the growth of the algae they worked with. 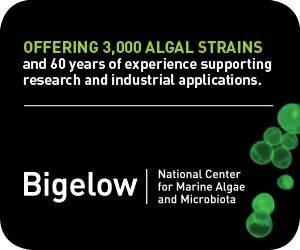 Algae with rich ammonia fertilizers grow quickly and were used only as a carrier to assimilate carbon dioxide and produce protein, which results in more CO2 fixation and growth. 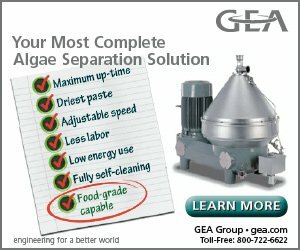 “Today, nitrogen fertilizers used in agriculture and biofuel production have become a major threat to many of the world’s ecosystems, and the nitrogen-containing residuals in biofuel production can eventually turn into nitrous oxide, which is about 300 times worse than CO2 as a greenhouse gas,” Liao said. “Our strategy effectively recycles nitrogen back to the biofuel production process, thus approaching nitrogen neutrality. “Growing algae to produce protein is like putting the interest back into the principal,” he said. According to Liao’s team, the culture area needed to produce 60 billion gallons of biofuels (30 percent of the United States’ current transportation fuel) based on the new technology could be as little as 24,600 square kilometers—equivalent to 1.9 percent of the agricultural land in the U.S. The research was partially supported by the UCLA–Department of Energy Institute for Genomics and Proteomics.